Located on a quiet street in Phuket’s mellow community of Kata Beach, Tik's Place offers quality rooms at yesterday’s prices. 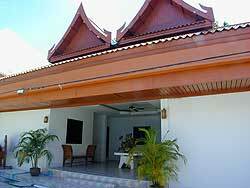 Tik’s Thai style guesthouse and service apartments are a bargain for travelers looking for modern amenities at reasonable rates. Nestled among the local tailor shops off the main road in Kata Center within walking distance to restaurants, pubs, shopping, massage and the beach, each room at Tik's Place is immaculate, spacious and includes queen-size beds, satellite TV, air conditioning, refrigerator, microwave, toaster, coffee pot, hot water, in-room safes, daily maid service and complimentary wireless internet access. Our beach, Kata Yai, is about a five minute walk. It is one of Phuket's most beautiful beaches with white sand, crystal clear blue waters and colorful reefs rich with sea life. Conditions are perfect for snorkeling. Longboats, Jet Skis, surfboards and snorkel gear are also available for rent. If you'd prefer a beach-side massage, Khun Sai Pin awaits your arrival. Just look for her umbrella! Just steps away from Tik's Place you'll also find a variety of restaurants, pubs, shops, tour agents, dive shops, massage centers and other places that'll make you happy. Everyone is friendly and helpful. If you cannot find something you are looking for, someone will certainly point you in the right direction. Our own Tiger Café, which doubles as our reception area, serves absolutely delicious Thai food (some of the best in town, really) and even Western breakfast if you drop by while Tik is working. She makes a killer egg over easy, something that is rare in this part of the world! Our café is more like a family kitchen, so rather than offering a full menu of items, we keep costs down and food quality high by making an assortment of Thai dishes with what is fresh and available. If you want something special, place your order early (before you go to the beach! ), then we'll shop for the ingredients and cook them up for you later! At Tik's Place, we like to take care of our guests as we would our own friends and family. We can arrange for a driver to pick you up from the airport, take you on a guided tour if you'd like to experience the island local-style or clue you in to the best spots for you to enjoy them on your own! We want you to enjoy your trip! We live upstairs from our Tiger Café just doors away from Tik's Place, which goes to show you that Kata is indeed one of the nicest areas with one of the most beautiful beaches on Phuket. We wouldn't have built our own home and business on the same street otherwise! And if our rooms are good enough for our daughters, we know you will be pleased! Tik's Place has not been discovered yet. It offers today's quality and amenities with yesterday's prices. Most of our customers are repeat customers. We are very proud of this. Come and meet Tik and her crew! We look forward to your arrival! 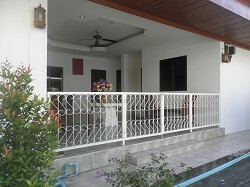 1,100 THB per night with minimum stay of 7 nights. Advance payment required. No refunds.